Once again we bring you the monthly update on the performance of Bondora’s recovery process across four countries – Estonia, Finland, Spain and Slovakia. Recovery rate in Estonia has averaged around 50 per cent while slowly but steadily rising under the current process. Legal litigation has recently been combined into the process to further boost recoveries. Recovery rate in Finland averages around 30 per cent and similarly to Estonia has been relative stable. Recent changes to recovery process have had a positive effect for the recovery rate. Legal litigation has replaced the debt collection process starting from August. All the debt cases under the old recovery process should be filed by September 2016. All the new cases are now filed automatically. Recovery rate in Spain has remained at around 45 per cent during the current process and is close to the performance in Estonia. Similarly to Finland, the recovery rate has seen a increase in the last quarters. Legal litigation will also be used in the future in a combined process to deliver highest possible recoveries. First cases will be filed in September. Recovery rate in Slovakia has remained high during the past year, averaging around 90 per cent. Slovakian operations were closed in first days of 2015. Since then the remaining portfolio has continued to be serviced. The 246 loans in default have been all been processed by one debt collection agency which started in the end of 2015. This month a second debt collection agency took over the portfolio that was not activated. The recovery team anticipates that legal litigation will be started for all cases that remain in the portfolio in Q4 2016. The priority today is to clear up the backlogs in Finland and Spain. Below you can see the recovery rates across markets per quarterly cohorts. The cohorts are made of loans that defaulted in that particular quarter. We calculate the recovery rate by comparing actual principal cash flow (net of write-offs) that occurred after the default with principal cash flow that we would have expected from the loan in case it had paid according to the agreed schedule. This measure allows us to determine the expected capital loss on loans that default. Data is aggregated to larger cohorts and recent data are excluded as otherwise outliers will skew the results too much (e.g. 1 customer repaying the full amount after default at once). On the Bondora level this means excluding the last three months of defaults and using country based quarterly cohorts. Data on individual portfolios should likely be viewed on a higher level either using yearly country based cohorts or simply quarterly cohorts across all countries. HOW TO FIND RECOVERY RATES USING BONDORA STATISTICS? 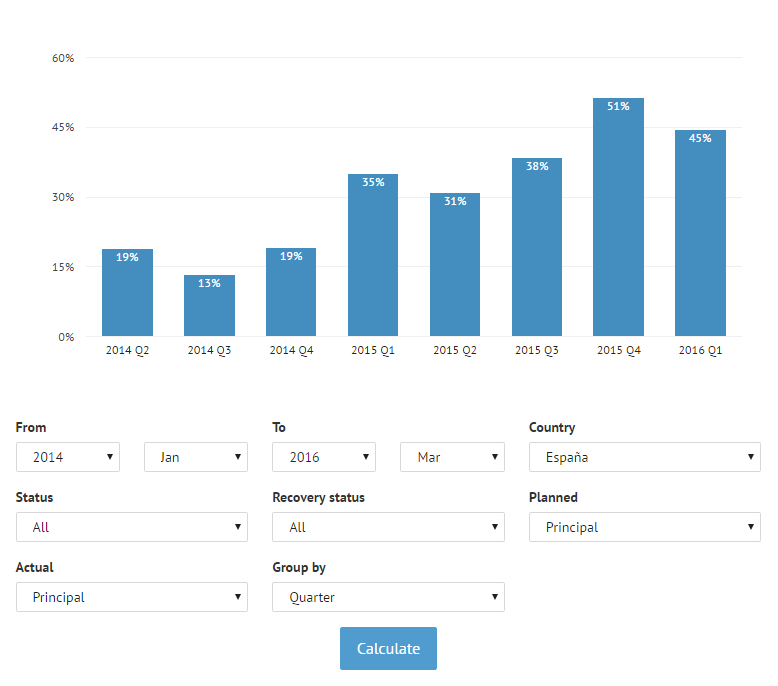 You can easily find information on recovery rates on the entire Bondora portfolio through the Recovery Rate chart on Public Statistics. The same chart is also available for the portfolio of each individual investor in your Personal Statistics page. Simply adjust the period, country, planned, actual and group by filters to pull out the numbers shown above. The period filter looks for loans that defaulted in the specific time range. Planned and actual filters make it possible to determine how the recovery rate is calculated. You can for example compare planned interest vs. actual interest received or planned principal vs. actual principal received. HOW CAN I USE THE RECOVERY RATE? The recovery rate helps you understand how much of the principal balance of loans in default you are likely going to receive. This figure can be used to adjust future cash flows and arrive at a risk-adjusted yield-to-maturity of your Bondora portfolio. 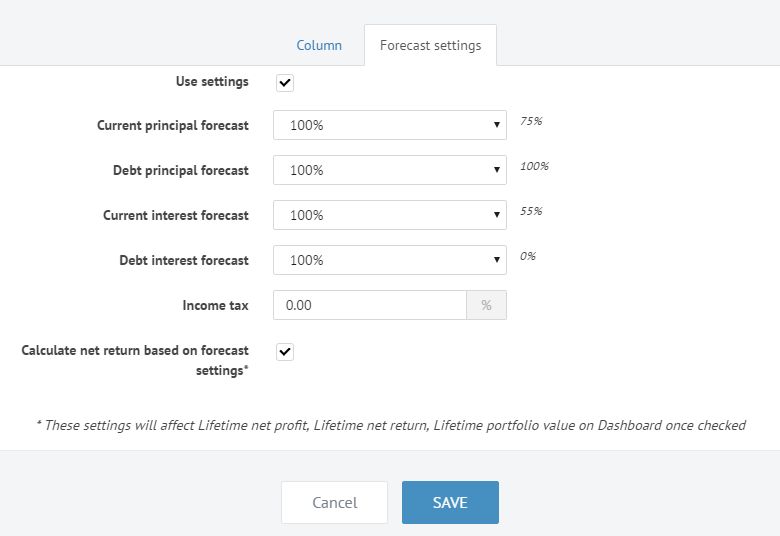 You can do this for your portfolio through the Cash Flow page Settings section. The Forecast settings provide you recommended ratios calculated on your portfolio historic cash flow that can be used instead of taking them from recovery rate charts. Some customers have criticized the recovery rate calculation stating that a borrower who defaults is liable to return the principal balance at once. This criticism is valid from a legal perspective but not from a financial. The right to demand immediate payment of the principal balance is stipulated in the agreements to make enforcing the contract economic. The cost of collection and recovery would be excessive if enforcement steps would need to be taken for each missed payment. This clause makes it possible to substantially reduce the number of steps necessary to enforce the contract and get the borrower to start making payments under the agreed schedule. The right to demand immediate payment of the principal balance does not mean it is reasonable to expect this to happen. Consumers take out loans to pay for larger purchases in affordable monthly payments. Loans would not be required nor interest paid on them if people would have the capital available themselves. Borrowers having financial difficulties are even less likely to have this sort of capital available. Therefore the main objective of collection and recovery is to restore the cash flow, or part of it. The success of these activities are measured by looking how much of the cash flow was restored.